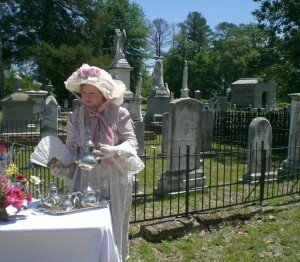 This cemetery tour is a little different than others though; as Jeffersonians of today will be in character portraying Jeffersonians of the past at their final resting place. 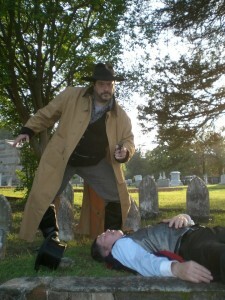 The historical characters include Sergeant Daniel Murphy, Reverend E.D. Benner’s children, Renegade Cullen Baker and Pioneer Lucy Ann Alley. American Sergeant Daniel Murphy served and died in Jefferson during reconstruction. He was awarded the Congressional Medal of Honor for his bravery during the Civil War. In the 1880’s infant mortality was an all too common occurrence. Hear the story of the Reverend Benner’s children and how they became a part of this tragic statistic of the 1800’s. Renegade Cullen Baker was once the most feared Gunman in Texas. He was known to carry four six-guns, a double barrel shotgun, six knives and a derringer, just in case! Lucy Ann Alley was the wife of one of Jefferson’s cofounders Daniel Alley. Here her story of Jefferson life in the 1800’s. I hope you will join us this Saturday, April 28, in Jefferson for this historic tour. Tours run from 5:00 to 7:00 PM and the price of admission is a donation. The cemetery is just north of the historic downtown district at the corner of E Webster and N Main.For more info call 903-665-7963. NACOGDOCHES- With the holiday weekend here, be sure to stop by the Farmer’s Market and stock up on a variety of fresh produce for your outdoor gathering. MYETX has compiled a list of motorcycle rallies from Jefferson all the way down to the Gulf of Mexico taking plalce in 2012. If you would like to add a rally to our list please contact our team at myetx.team@gmail.com. Beech Woods Lufkin, TX. An easy day hike through the mature beech-magnolia-loblolly forest, located in the Big Thicket Preserve.